Unfortunately, unnecessary injuries from falling objects on construction sites are common. When tools, building materials, debris and other relatively heavy objects accelerate to high speeds in the process of falling, they cause catastrophic and potentially fatal injuries to construction workers below. Even an object as small as a bolt can cause serious injury if dropped from a number of stories above a worksite onto a construction worker. 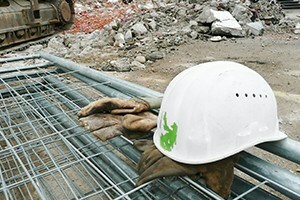 Heavy winds can cause unsecured construction materials or equipment to fall and strike workers. Because falling objects are a known hazard in the construction industry, the Washington Administrative Code and other government regulations require that construction companies adopt regulations to require that objects overhead are properly secured to prevent falling objects from hitting workers. When these standards are violated by construction companies or contractors, construction workers struck by falling objects can sustain serious head injuries, brain injuries, spinal cord injuries, or other disabling injuries that can end careers and destroy families. If you or a family member was struck by a falling object that was not secured or if a structure falls on you during construction work, our law firm is prepared to help you evaluate your claim and decide on the best course of action. As experienced personal injury lawyers, we know that a prompt and complete investigation is vital to the evaluation and prosecution of a construction injury case. When you sustain a serious injury from a falling object or other incident on a construction site, contact our firm for a free evaluation of your case. We're here to help you begin putting your life back together. At Kraft Davies, PLLC, we have expertise in representing construction workers injured on job sites from falling objects and other causes. When you or a family member sustains a serious injury in a construction accident, contact our firm for a free case evaluation. There is no obligation and you will have more information to make an informed decision on how to proceed. Because the facts of the incident are critical in any case, it is important that you contact us as soon as possible so that we may begin an investigation before changes are made to the scene or witnesses' memories of the event fade. For more information or to schedule an appointment with an experienced attorney regarding a case that involves a construction injury, injuries from falling objects on construction sites, construction law, premises liability law, maritime law, admiralty law or other workplace personal injury, please contact us or call 206.624.8844 for a free initial consultation. Representing workers hit and injured by falling debris, we work to help our clients recover compensation for their injuries and losses.